Life has been very busy here at the Creative Family household, so I’ve been very pleased to have been able to provide you with some fabulous guest posts. Today, I’d like to welcome Malia from Playdough to Plato. Take it away Malia! Several years ago, my oldest son was at the beginning of his first picky eater phase. Hoping to make dinner time more enjoyable, I asked a parent educator to share her favorite survival tips. 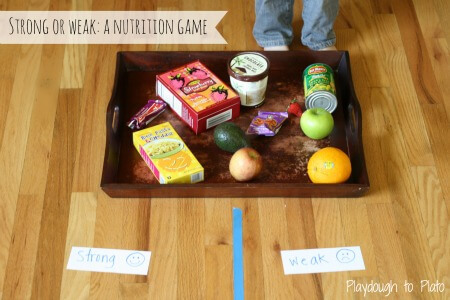 One of the simplest suggestions she mentioned was the one that helped my son the most: she taught children to call healthy food “strong” and junk food “weak”. By using words that explained how the foods would make them feel when they were finished eating, kids were motivated to eat healthier. I immediately decided to make the vocabulary switch in our home too. 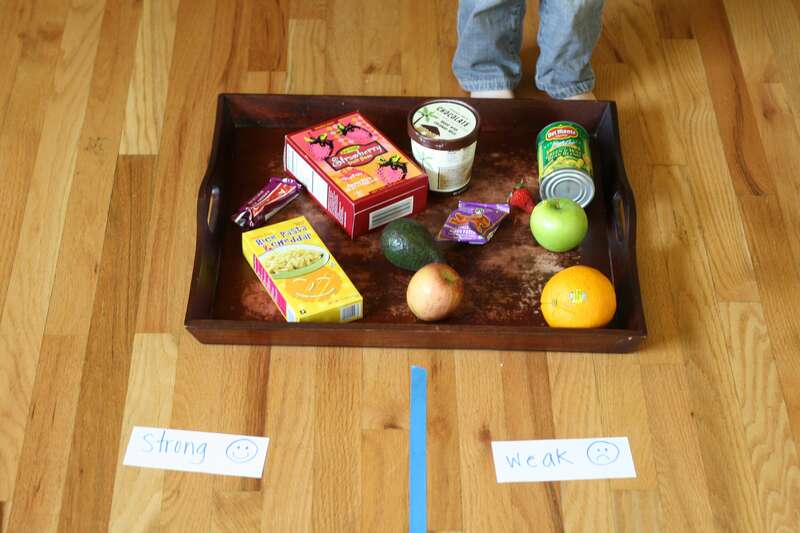 That night, I placed my son’s plate in front of him and pointed out all of the strong foods he’d be eating. We had a nice, two-year-old conversation about the difference between “strong” and “weak foods” and then, to my surprise, he picked up his spoon and started eating. No complaints. No food on the floor. We have been using those same words ever sense and I’m convinced that they have saved us from countless picky eater tantrums. I thought it would be fun to share the trick with all of you by creating a simple, kid-friendly game to help make the learning curve move quickly. My now 3.5 year old son and I cozied up to read The Very Hungry Caterpillar together. 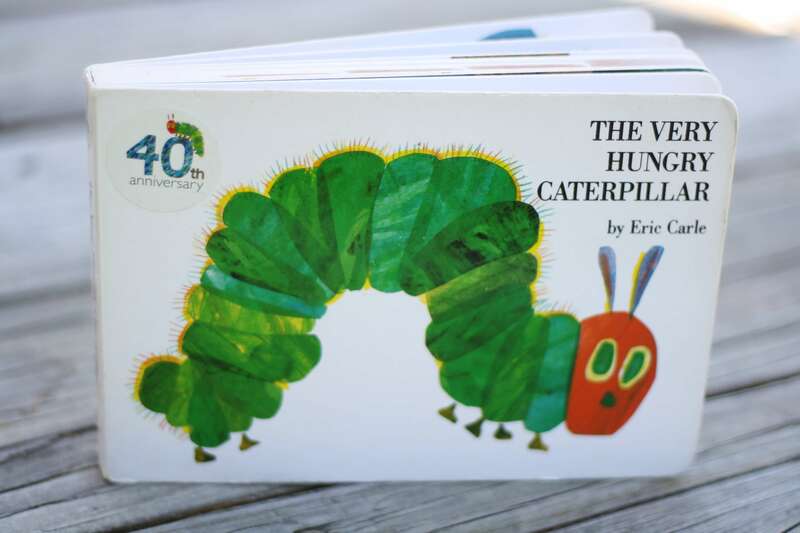 It was the perfect introduction to our game because the caterpillar feels so sick after eating the cupcake, lollipop and other weak treats. It was time for my son to get to work sorting. He raced from the food pile to the labels, laying each item in the right spot. Most foods landed either on the right or left side, but he decided to place a few (including this box of macaroni and cheese) smack dab in the middle since it was a little of both. 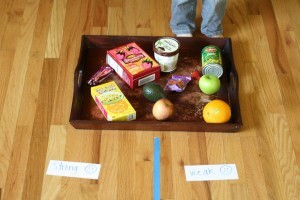 Strong-Weak was a perfect combination of fun and nutritional learning. 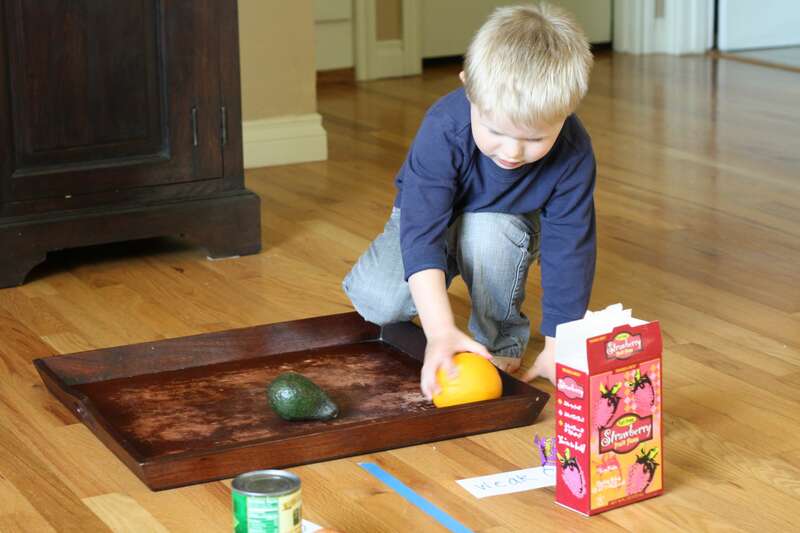 I hope your family will enjoy this picky eater trick too! Malia is a former kindergarten teacher turned stay at home mom who shares hands-on reading, writing and math games at Playdough to Plato. Stop by to download a free set of alphabet tracing cards and follow the blog by email. This is an amazing idea, Terri, with SO many learning extensions. It can be customized for kids of many ages. I'd love it if you'd share this at the After School Linky Party on my blog right now: deceptivelyeducational.blogspot.com. Thanks! My household has a definite tendency to prefer weak foods. I will try calling all our sugary treats weak and see what happens. Fabulous idea! I love the vocabulary switch.